Needless to say, the past few months have been dark times at our office. But, alas, the deadline was in sight! It was so close everyone could taste it. And to wash it down, I, the sole person excepted from this deadline, wanted to make cookies. A sweet celebration for the parched palettes of these dear friends of mine. And so, I consulted Joy. Joy the Baker is a genius. She’s a cook, a storyteller, a photographer, and, let’s be honest: she’s easy on the eyes, too. Joy told me of Brown Butter Chocolate Chip Cookies. If you know me, you know I love chocolate chip cookies (CCC for short). They’re the best. They’re my favorite. Everyone knows this. And if there’s one thing that could make a CCC better, it’s brown butter. Good idea, Joy! You’re the best. Sunday afternoon soon became Sunday evening, and, remembering my sad comrades who were indeed still at work, I set to work baking. I read intensely the recipe, I measured exactingly, and I mixed ingredients feverishly. I was determined to make these cookies amazing. To make them a reward worthy of my dedicated and weary co-workers. The house smelled like Christmas and heaven and adorable baby kittens. The cookies went together wonderfully. It was like my kitchen apparatuses were enchanted Fantasia-style, except without ever getting completely out of hand at the end. I browned the butter perfectly. I let the dough “rest” in the fridge like a boss. 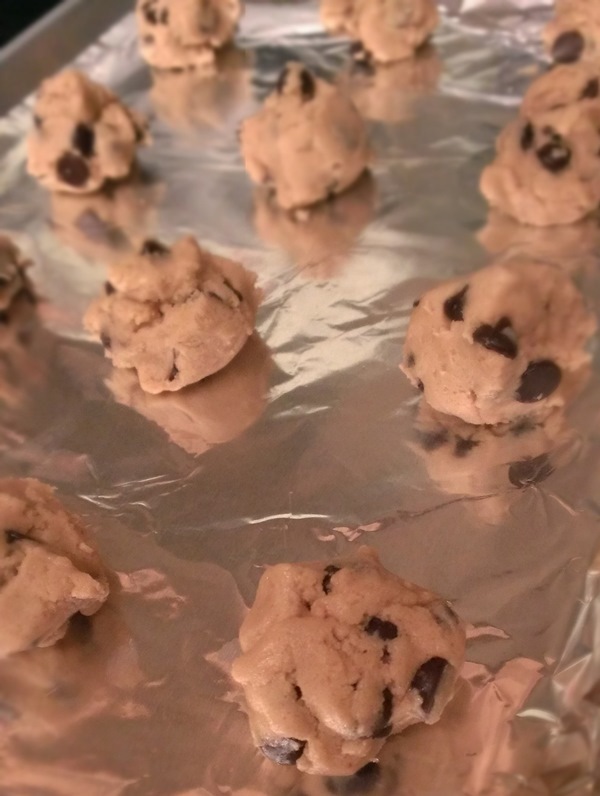 I lightly salted the tops of the cookies before baking to add a bit of extra pizzazz which Joy suggested. I tasted one when they were finished. Perfection! I packaged the cookies carefully and held them in my arms as I walked to work on Monday. I arrived to the office with the precious cargo and placed the container lovingly in the kitchen for all to see. And I waited. And people asked me if I made the cookies, and I confirmed. And they asked if they were made from scratch, and I confirmed. And I waited some more. And one guy told me they were good cookies. But he sits right next to me, so he probably felt obligated to try one. And by the end of Monday, when the huge, all-consuming project had left our office, and the weary troops were done with their task, there were only six cookies gone! Yes, I counted them. There are more than a dozen people in my office. Not even half the people had eaten a cookie! What is wrong with these cookies? I consider myself an authority on cookies. These were decidedly good. Right? Right?? I tried them; they were delicious. What is wrong with these people? I was sad. Were my cookies not as good as I thought? How could they resist them if they were?! Over the next three days (three! ), more were eaten, and I received more half-hearted compliments. I gathered up six cookies to take to other friends who don’t work in our office, since there were still so many left on Wednesday night. I watched as they dwindled at a pace slower than celery sticks at a pizza party. I pouted. Today, Thursday, my co-worker came back from his honeymoon. He’s been gone a week and a half, and he missed out on the first few days of cookies. He’s a fellow cookie lover and connoisseur, whose cookie opinion I trust. He had not mentioned anything all day about said baked goods. Then, at 6:30pm, as I readied to leave, he sauntered to my desk. “Those cookies are amazing,” he said. And the weight of a thousand cookies melted away. “Really?” I asked, spirits lifting. And I knew they were good, even though his sentiments regarding my overall baking skills were misguided and generally inaccurate. And I knew that something was just gravely wrong with my co-workers. Perhaps it was the weariness of exhaustion, or the general confusion and chaos of a deadline, or their irritatingly persistent health conscious-ness. We may never know. But we do know, with certainty, that Joy and I can combine powers to make an amazing cookie*. *Fine, she can also singularly, without me, make an amazing cookie. And probably lots of other things. But we also, together, can do a decent job. What the heck! Make them for the Serangs! They over-appreciate chocolate chip cookies! 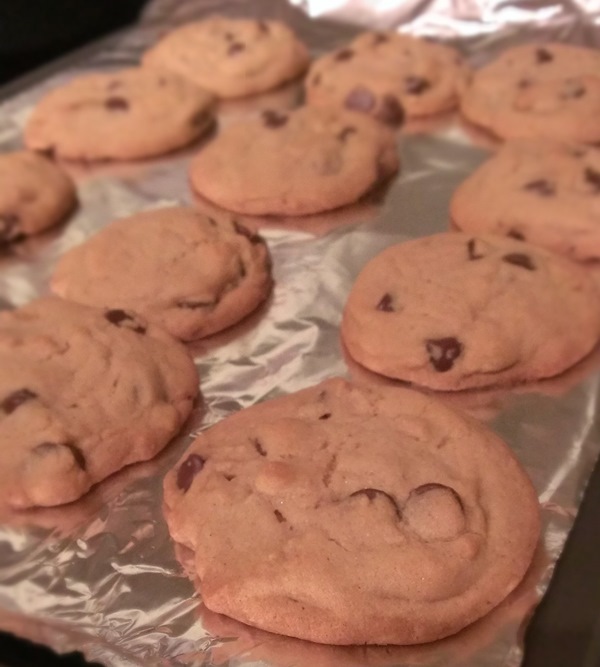 Who could say no to chocolate chip cookies? !